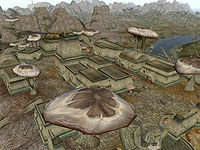 Ranyon-ruhn is a small Telvanni settlement with an ebony mine. The town is composed of Velothi buildings with one "Telothi" house. 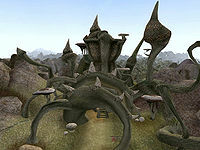 The local Telvanni lord, Master Mithras, lives in a Telvanni mushroom tower just outside of the town. The town has a small Tribunal Temple, a Silt Strider port, an alchemist, a healer, and a tavern called The Dancing Jug. 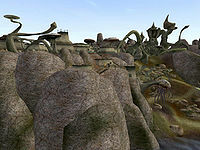 A silt strider can be taken to Bal Oyra, Tel Ouada, and Helnim. 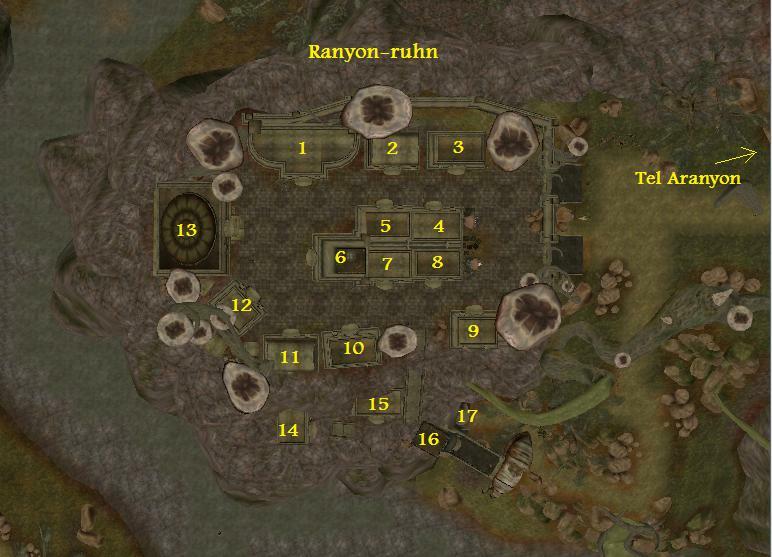 An early concept map indicates that Ranyon-ruhn is supposed to be Glen Haven from Arena. A Most Displeased Noble: The mine workers are unhappy, but why? A Delayed Shipment: Discover why a shipment wasn't delivered to Ranyon-ruhn. Unconventional Methods: Finding some workers for the mine is proving to be a lot of work. Daggers and Chains: Be careful around Argonian slaves, they may be armed to their teeth. An Offer She Can't Refuse: The assistance of Galdasi Thendas is required, but to what end? Balancing Act: The ebony mine in Ranyon-ruhn is still losing money, so you need to take a dive in its paperwork. Treachery Revealed: Finally, we get to know exactly who stole the ebony from the mine. The Final Search: The traitor's house has been watched from several angles, so how could he have disappeared? Alchemical Slander: A newcomer is trying to bring the reputation of two local alchemists into disrepute. The Coward and the Tomb: We all know that ancestral tombs can be scary, but the tomb of your own family? The Drunken Knight: A drunkard once was a noble knight. Help him to become one again. Romance in Ranyon-ruhn: The Ranyon-ruhn guard captain, Simeth, is in love with Nataya Radasar and you should help him to get her attention. This page was last modified on 6 March 2019, at 08:44.